Published: March 16, 2013 at 02:53 p.m. Updated: March 17, 2013 at 10:14 a.m.
Elvis Dumervil didn't expect to be a free agent right now, but thanks in part to a very naughty fax machine, the veteran defensive end is looking for work. Take a look at the best remaining free agents and see where they might land. NFL Network's Michelle Beisner reported Saturday Dumervil is "not generating a lot of interest" from NFL teams, according to a source close to the situation. Obviously, there's concern among teams that Dumervil might wind up back with the Denver Broncos. With the NFL Players Association planning to look into the technological meltdown that led to Dumervil's release Friday, teams have yet to make a push for the 29-year-old pass rusher. Back to the Broncos: Denver still is in play to re-sign Dumervil. The Broncos had no interest in paying him $12 million per year, but most teams aren't going to venture anywhere close to the $8 million per year Dumervil was being offered as part of his revised one-year pact. The sticking point here is greenbacks. The Broncos are saddled with Dumervil's $4.8 million salary cap hit after a shopping spree that netted Wes Welker, among others. Realistically, it might be best for both sides to move on. Miami Dolphins: Why not, right? They're taking everyone else off the market. If the Dolphins re-sign Jake Long, the money to land Dumervil is gone. If Long lands elsewhere, Dumervil would make Miami's free agency haul as intriguing on defense as it has been on offense. General manager Jeff Ireland faces a contract year and he's going for the throat. Besides, it sounds as though Elvis has genuine interest in the Dolphins. Tampa Bay Buccaneers: Tampa Bay cooled on Michael Bennett (which baffles me), but they still need help at end in Greg Schiano's 4-3 defense. The Bucs are kidding themselves if they truly believe Da'Quan Bowers is a "player with more upside" than Bennett. The 29-year-old Dumervil would bring immediate pass-rush help to the Bucs, and the team has dollars to burn. Buffalo Bills: The Bills haven't made a splash in free agency. Landing Dumervil would give Buffalo true heat on the edge. 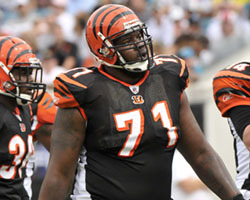 Used in combinations with Mario Williams and Mark Anderson, Dumervil would give the Bills one of the AFC's more complete defensive fronts. Can he play quarterback? That would help. New England Patriots: It seems too obvious, but this would amount to a Bill Belichick masterstroke for the veteran coach. Snatching up Dumervil addresses the team's queasy pass-rush situation and lands a body blow to the Broncos on the heels of the Welker defection. When it comes to the money, all five teams could craft a contract for Dumervil if the desire is there -- and the fax machine is plugged in.